The information contained in this site is for entertainment and informational purposes only. The site creator is not responsible for you, your car, your errors, or your economic losses resulting from your use of this information. Additionally, this site and its content are not affiliated with Volkswagen of America nor Volkswagen AG. "VW" and "Volkswagen" are registered trademarks of Volkswagen AG and are used on this site for descriptive purposes only. No text on this site may be copied to or used on other web sites without written permission of the site administrator; the only exception to this is if proper credit is given to this site when quoting copied text. Status: This coolant has been discontinued by VW/Audi. January 2016 Update: Pentosin is still producing their Pentofrost NF (G11), which is available at NAPA, O'Reilly, and other retailers. Rowe Hightec AN G11 is also available (TL 774-C). 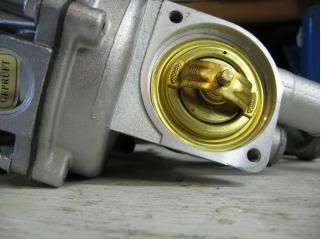 However, you can still flush the system and use a newer coolant, G13 being recommended by VW and Pentosin (see below). You can use any coolant/anti-freeze so long as it is phosphate- and phosphorous-free and is mixed with distilled water, if not pre-mixed (see mixture table below). There are numerous aftermarket brands that mix with any coolant, and most coolants are now phosphate-free since most manufacturers are now using aluminum radiators and other components. If wanting to stick with VW/Audi Autobahn or Pentosin brands, be aware that you cannot mix blue coolant (G11) with pink coolant (G12), but you can mix blue (G11) with purple (G12++). Refer to the compatibility table below for additional information. Turn the heater temperature lever to "hot". (A/C-equipped cars: turn the lower lever to "vent".) Keep the blower fan off. Remove the expansion tank cap and temporarily set it aside in a safe place. Pour in coolant until it reaches and stays at the "full" mark. If desired, use a cooling system pressure tester to push coolant into the system and/or to check for leaks (do not pump more than 15 psi into the system!). Turn the engine on and let it idle (if you used a pressure tester, remove it first!). Keep an eye on the expansion tank. Once coolant begins flowing in from the radiator, squeeze the upper radiator hose a few times. Reinstall the expansion tank cap and keep an eye on the water temperature gauge as you wait for the cooling fan to turn on. If all is well, the fan will turn on and the gauge will read normal. If it does, turn off the engine, let it cool down, recheck the coolant level, and top off if need be. Done. Other folks have you fill the system via the upper radiator hose; this is totally unecessary (not to mention a PITA) and puts undo wear on the hose. However, if you prefer this method, feel free to use it. If your car is having an air bubble issue, a common trick is to drill a small hole into the thermostat, which allows for internal air bleed-off. I, personally, have never had a need for this in nearly 30 years of ownership, but others have encountered air issues leading them to automatically drill the hole on every new thermostat they install. Use the method that works best for you and your car. Not keeping up with timely coolant flushes can lead to internal cooling system corrosion. Flush the coolant every 30,000 miles or every 2 years, whichever comes first, if using G11; if you have switched to a G12 variant or G13, the flush interval is increased to 4 years. From 1979-1983, Rabbit Convertibles did not have a coolant expansion tank; they had the old style system wherein the coolant was added directly to the radiator via the radiator cap. From mid-1983 to 1993, Rabbit Convertibles and Cabriolets came with expansion tanks; some 1982 models may have the bracket for the expansion tank but VW continued to use the old cooling system on most, if not all, 1982 and most 1983s. If you would like add an expansion tank to your system you will need the following parts: newer style radiator, hose from radiator to expansion tank, expansion tank, hose from expansion tank to coolant return pipe and a coolant return pipe. When the coolant reaches a specified temperature. The thermo switch in the radiator is normally open; when the coolant reaches the switch's pre-determined temperature (see below), it closes completing the path to ground, which turns the fan on. 1988-1993: The two-speed fan runs on low. When the A/C compressor engages. When any of the A/C settings are switched on and the compressor engages, an electrical signal is sent to the A/C relay, which in turn sends a signal to the fan, switching the radiator cooling fan on. 1988-1993: The two-speed fan runs on high. After engine shut-off, if the under-hood temperature is above a specified temperature. 1980-1987: The single-speed fan will run until the radiator fan thermo switch opens, thereby interrupting the ground path. The fan usually doesn't run for more than a couple of minutes and definitely not more than 5 minutes. If the fan runs longer than 5 minutes, there is a problem. 1988-1993: The two-speed fan will run on high until the after-run thermo switch cuts its electrical path to the after-run control unit. The fan usually doesn't run for more than 5 minutes, but is capable of running for up to 15 minutes. If it runs longer than 15 minutes, there is a problem. Cabriolets up to 1987 with A/C do not have two-speed cooling fans; these cars have one-speed fans that are two-stage (fan is turned on when the A/C is turned on). From 1988-1993, Cabriolets were equipped with two-speed fans; those with A/C would then have two-speed, two-stage cooling fans. Check the fan motor and thermo switch by completing the following steps. Disconnect the thermo switch connector. Using a jumper wire, make a connection between terminals (2-speed fans: low speed is red/white wire, high-speed is red/black wire). Leave this connector disconnected! By jumping these terminals, you are bypassing the fan switch and supplying 12v directly to the fan motor. Does the fan run? Yes: The thermo switch is faulty and needs to be replaced. No: Proceed to step 4. Check for voltage at the thermo switch connector (red wire). Is there voltage? Yes: Proceed to step 5. No: Check fuse #1. If the thermo switch is good and the fuse is good, the thermostat (in the water pump housing) may be faulty. 1988-1993 Cabriolets: The after-run relay mounted on the driver's side fender may be faulty, and/or the after-run thermo-switch (back side of the cylinder head) may be stuck open. Replace the radiator fan switch. 1988-1993 Cabriolets: The after-run relay mounted on the driver's side fender may be faulty, and/or the after-run thermo-switch (back side of the cylinder head) may be stuck closed (permanently grounded). Faulty reservoir cap, faulty reservoir, faulty after-run thermo switch and/or relay (1988+), blocked radiator, faulty cooling fan thermo switch. Thermostats & fan switches go hand-in-hand. When replacing one, you should replace the other and both should match temperature-wise (see below). Always, always, always test a new thermostat in a pot of boiling water to ensure that it works before installing it in the car. An 87° thermostat begins opening when the coolant temperature has reached 87°C and is fully open at 102°C. If wanting to change to a lower-temp thermostat, you must change the thermo switch to a lower temperature version (or vice versa). The low-temp thermostat is 80°C; the matching thermo switch is 85-80°C. Some parts stores incorrectly list the thermo switches as being "with A/C" and "without A/C". From 1980 through 1987, Cabriolets use one-speed fans and use the black 95-84° switch; 1988-1993 Cabriolets use two-speed fans and use the white 95-84/102-91° switch; A/C is irrelevant. See the electrical page for further info. The purpose of the cards is to direct airflow through the radiator with little air escaping around the radiator; this enables the cooling system to work more efficiently. New OEM baffles are no longer available. The cards were originally made out of cardboard which, over time, disintegrates. Rather than sourcing used cardboard radiator baffles, you can easily make new, long-lasting ones yourself out of sheet metal from your local home improvement center. Simply click on the links below to download the templates (only the AutoCAD download contains genuine, full-size templates that can be printed at your local Kinko's, etc. ; the others contain measurement templates for use as guides in making the baffles). Although not all baffles are listed for all years, they can be adapted to fit your particular car. Update: New, quality replacement top baffle is avavailable from the UK at the Sportline store. Thank you to Thomas for creating and sharing these files! Only Cabriolets with JH engines in North America have oil coolers; "why?" remains to be answered. In Europe, only the EG, JH, 2H, DX and KT engines came with oil coolers. If your Cabriolet is without an oil cooler, you can install the OEM cooler (additional coolant hoses will be needed), or an aftermarket cooler that utilizes air, rather than coolant, to dissipate heat from the oil. For coolant/water temperature gauge information, please go to the Gauges page.